What is a Phakic IOL? What is the anesthesia & discomfort involved? Phakic Intra-Ocular Lens or Implantable Contact Lens is a very thin lens that is implanted in the eye over the natural lens of the eye. The natural lens is not removed here. Phakic IOL / ICL implantation is used for treating extremely high refractive errors which are not possible to treat with Lasik or where presence of problem prevents the use of Lasik. This is especially useful for extremely high myopia of more than about –10.0 dioptres. A person with high refractive error e.g. myopia more than –10.0 or hypermetropia more than +6.0 or lower refractive error where Lasik is not feasible due to e.g thin cornea. The eye should otherwise be healthy and the anterior chamber depth as measure by Ultrasound (A-scan) should be at least 2.8 mm (excluding corneal thickness – Pachymetry from the measurement). Unlike Lasik this procedure does not involve removing any tissue or reduction in corneal thickness and it is reversible. The quality of vision is better because the optic zone achieved is normal & much larger than Lasik. And unlike lens replacement surgery the focusing ability of the eye (Accommodation) is preserved. 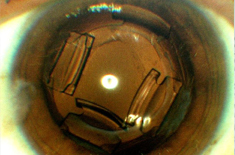 It is possible to correct extremely high refractive error e.g. –20.0 D or so with excellent results by this technique. Introduction of infection into the eye leading to endophthalmitis. It is a relief to know that all these complications are rare and can be managed by appropriate treatment. A painless procedure, it is done using the eye-drop or Topical Anesthesia where the anesthetic eye drops instilled into the eye. Reasonable cooperation is required on part of the patient who has to stare into a bright light while the surgery is done which takes about 10-15 minutes. Some degree of pressure and stretching in the eye may be felt. What are the alternatives / options? Use of spectacles or contact lenses are the non-surgical options while some form of Lasik or Lens replacement surgery are the surgical alternatives in appropriate cases. As a preliminary step a YAG Laser Iridotomy is performed a few days before the surgery. Here alternative openings in iris are created for the aqueous fluid to circulate in the eye. This is done to prevent occurrence of glaucoma – increase in intra-ocular pressure due to obstruction to fluid flow. The surgery is done under Topical or eye drops anesthesia and does not involve any injections into the eye. The patient needs to lie on the operating table and stare into a bright light. A small incision of about 3 mm is made at the junction of black & white of the eye (Limbus) and the Phakic IOL / ICL is implanted into the eye through this incision and fixed in the correct position. Then the eye is washed with medicines containing antibiotics and other solutions. The incision is self-sealing and does not required any sutures / stitches. There is not even a need of a bandage on the eye. The whole procedure takes about 10-15 minutes. The patient rests in the hospital for about a couple of hours and can then walk back home. On the day of surgery the vision is blurry and mild discomfort in the eye can be felt. The vision becomes clear over the next few days. Follow up examinations are done on the next day and then weekly for a few weeks. The second eye can be operated after about 3-4 weeks. What are the implants & material used? Sulcus Fixated: These are placed behind the iris and in front of the natural lens of the eye. These are not visible to the observers after the surgery (unlike the other two where the lens can be easily seen by an observer). They are currently the best option. Iris Fixated: As the name suggests these are fixed to the iris with the help of two claws in the structure of the lens. These are non-foldable and thus need a larger 5-6 mm incision for their implantation. Angle Fixated: Placed in the anterior chamber of the eye they are the closest to the cornea and, therefore, pose the highest risk to it. These lenses are high precision microscopic optical devices manufactured after years of research and development. All this makes these lenses very expensive. For measurements of the eye sophisticated ultrasound equipment is used and for performing the surgery high quality surgical microscopes & other instruments are used. How much is the time taken for surgery, in hospital and for recovery? The surgery takes just about 10-15 minutes whereas the time spent in the hospital from preparation to discharge, may be about 3-5 hours. It is advisable for the patient to rest at home for 1-2 days after which normal life routine can be resumed. The vision is reasonably recovered by the end of one week. What are the precautions & care before & after the surgery? Antibiotic eye drops are to be instilled for 2-5 days before surgery and eye makeup is to be avoided. It is important to rule out any infection in any part of the body, therefore, any systemic problem (however unrelated it may appear) should be brought to the notice of the eye surgeon. Rest is advised for 1-2 days after the surgery following which light routine activities can be resumed. Visually strenuous work can be resumed after 1 week whereas vigorous physical activity should be avoided for a month. Splashing of water into eyes, swimming and eye-makeup should be avoided for a month. The medication as advised by the surgeon may have to be instilled for about 2-4 weeks and the follow-up schedule should be adhered to. Long term results of this procedure are not known, however, there is no foreseeable long-term complication. The age related cataract developing in later years can be easily managed by simply removing this lens during the cataract surgery. What are the advantages of getting it done by you / your hospital? Besides the best equipped operation theatre and most advanced equipment required for this surgery we have implemented international quality & safety protocols to give the best possible results to our patients and to minimize problems. Backed by our experience of the satisfied patient for last 3 years, we feel confident about providing the best care for your eyes.